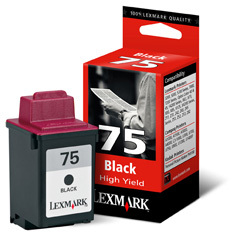 Genuine OEM Lexmark 12A1975, Lexmark#75 High Yield Black Inkjet Cartridge. They are designed to work in the Compaq A1000 printer/copier(s). Genuine OEM Lexmark 12A1985, Lexmark#85 Color Inkjet Cartridge. They are designed to work in the Compaq A1000 printer/copier(s).